Levinson’s principal teachers were George Crumb, George Rochberg, and Richard Wernick at the University of Pennsylvania; Ralph Shapey at the University of Chicago. He then studied at the Paris Conservatory with Olivier Messiaen, for whom he later served as translator and assistant. He is the Jane Lang Professor of Music at Swarthmore College, where he been on the faculty since 1977, and has twice served as Chair of the Department of Music and Dance. He spent 1979-80 in Bali as a Henry Luce Foundation Scholar, composing and studying Balinese music, and returned there in 1982-83 as a Guggenheim Fellow. Levinson has received numerous awards for his music, including two fellowships from the National Endowment for the Arts, the Goddard Lieberson Fellowship and the Music Award from the American Academy of Arts and Letters, and the Pew Fellowship in the Arts (2007). His music has been widely performed in the US and Europe by major orchestras and ensembles, such as the American Composers Orchestra, the London Sinfonietta, the Rochester Philharmonic, the Los Angeles Philharmonic, the Philadelphia Orchestra, the Seattle, Indianapolis and Cincinnati Symphonies, the City of Birmingham (England) Symphony Orchestra, the orchestras of the Aspen and Tanglewood Festivals, and many others, led by such conductors as Sir Simon Rattle, Christoph Eschenbach, Oliver Knussen, Gunther Schuller, Gerard Schwarz, Esa-Pekka Salonen, David Zinman, and Hugh Wolff. His principal works include two large-scale symphonies: Anahata (Symphony No. 1) (1986) and the Second Symphony (1992-94) (commissioned by the Koussevitzky Foundation and premiered by the Los Angeles Philharmonic, conducted by Sir Simon Rattle) as well as six other works for large orchestra, and numerous other chamber-orchestra, ensemble, vocal, keyboard, and band works.. His Five Fires (1995) was broadcast worldwide by the BBC as part of the 1997 Masterprize Competition for orchestral music, and was awarded the Prix International Arthur Honegger. Two of Levinson’s recent works were commissioned by the Philadelphia Orchestra: Avatar (2003), for the inaugural concert of Christoph Eschenbach as Music Director in 2003, and Toward Light (2006) for organ and orchestra, for the dedication of the new organ in its concert hall, Verizon Hall. His newest works include Three Fables (2009) for narrator, violin, and cello, to poems by Robert Lax (commissioned by the American Composers Forum for Auricolae Children’s Music Ensemble), and Now Your Colors Sing (2011) for double string orchestra (for Orchestra 2001 and the Philadelphia International Festival of the Arts). His current project is a solo organ work for Olivier Latry. for Chamber Ensemble 20:00 0 1(dbl. E.H.) 2(B.Cl.) 0 1Sop.Sax. 1Bar.Sax. – 0 0 0 0; 1Perc. Guit. Song Cycle for Soprano and Seven Players 21:00 Soprano; Fl./Picc./A.Fl. Ob./E.H. Cl. B.Cl. Vln. Vcl. Pno. for 15 Instruments 12:00 2(2 dbl. Picc.) 1(dbl. E.H.) 2(1=EbCl., 2-BbCl.) 1(dbl. Cbsn.) – 1 2 1(=B.Tbn) 1; Hp. Pno. 2Perc. for Chamber Ensemble 10:00 Fl. Ob. Sax. Vcl. Cb. Guit. Pno. Perc. for Soprano and Seven Players 17:00 Solo Sop. ; 2Fl. Vla. Vcl. Perc. Pno. Hp. for Piano and Chamber Ensemble 28:00 Solo Pno. ; 1(dbl. A.Fl.) 1(dbl. E.H.) 1(dbl. B.Cl.) 0 – 0 0 0 0; 1-2Perc. Vln. Vcl. Vla. 32:00 4(2Picc.) 4(E.H.) 4(EbCl. B.Cl.) 3(Cbsn.) – 4 4 3 1; 5Perc. Pno. Cel. Hp. Str. 9:00 3(2Picc.) 3 4(EbCl.) 3(Cbsn.) – 4 3 3 1; Timp. 3Perc. Pno.(Cel.) Hp. Str. 24:00 1(Picc./A.Fl.) 1(E.H.) 2 1 – 1 2 1(B.Tbn.) 0; 2Perc. Pno.(Cel.) Str. 24:00 3 3 4 3 – 4 3 3 1; 4Perc. Hp. Pno. Str. for 13 Players 35:00 2 1 1 0 – 1 0 0 0; 2Perc. Pno.(Cel.) Hp. 2Vln. Vla. Vcl. 40:00 5(2Picc./A.Fl.) 4(E.H.) 4(EbCl./B.Cl./Cb.Cl.) 4(Cbsn.) – 4 4(in C) 4 1; Timp. 4-5Perc. Pno. Cel. Hp. Str. for Orchestra 19:00 3 3 4 3 – 3 4 3 1; 4Perc. Pno. Hp. Str. 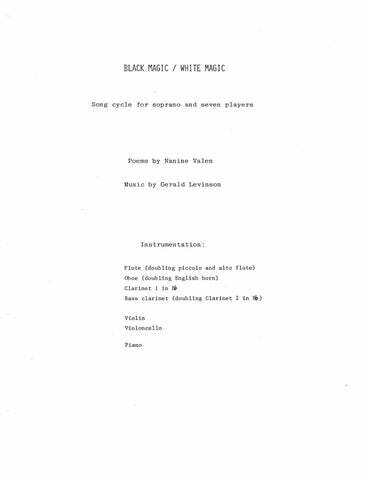 for Solo English Horn and Orchestra 16:00 Solo E.H.; 2 2 2 2 – 2 2 2 0; 3Perc. Hp. Str. 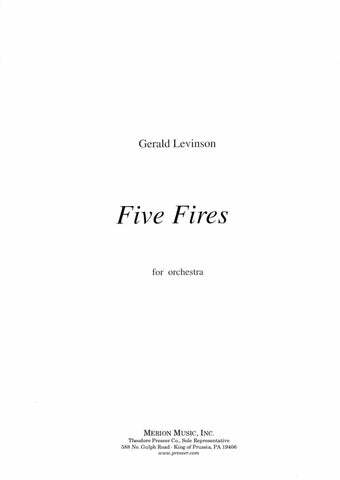 Gerald Levinson’s orchestration and instrumentation are admirable. His style, combining a highly expanded modern tonality with memories of the metallophones of Bali, is very beautiful, very original, sometimes powerful, always moving. …there’s no denying [his] ornate, spell-casting music has potent sensual appeal. …an imaginative explorer of sonic landscapes and visionary epiphanies. Levinson remains, moment by moment, sheerly gorgeous, with shimmering, iridescent harmonies and plush-velvet melodi[es] that spin on and on into the silence, like pyrotechnics against the night sky, decelerated into the slowest of slow motions. …signals a larger harmony of eastern and western musical thought. …impressed for its mighty sonorities, long breathed melodies, and often glorious percussion racket, inspired by music of Bali and North India. A rich, colorful, and substantial composition… melismatic cries of hard, bright outline from clustered woodwinds; slow harmonic progress through deep, lush added-note chords; the crash and peal of gongs and bells… shimmering aftertones… well proportioned, admirably controlled, and beautiful. 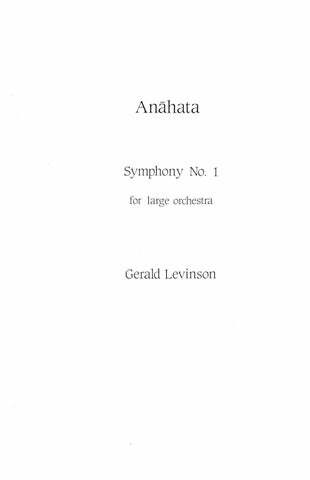 Gerald Levinson’s “Anahata: Symphony No. 1” is an exuberant 30-minute work of tremendous inventions and aural seductiveness… with its utter sincerity and clear-skied, all encompassing horizons, this symphony, quite literally, ravishes you. When the final notes faded away, it was Leonard Bernstein, seated in the audience, who started the standing ovation. With its thick, clangorous sounds, its pungent combinations of double reeds and other instruments, its rhythmic pulsation and its air of concentrated repose, “Anahata” is utterly original and, more important, highly communicative. “Anahata” projects a sense of serenity and balance— the feeling that there is something right. 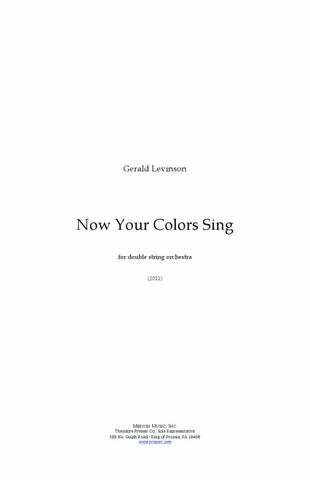 The listener first introduced to the music of Gerald Levinson will almost surely be struck by the fact that his is an artistic voice that will not be contained by any of the factionalized ‘isms’ which have dominated our contemporary musical landscape in recent decades. 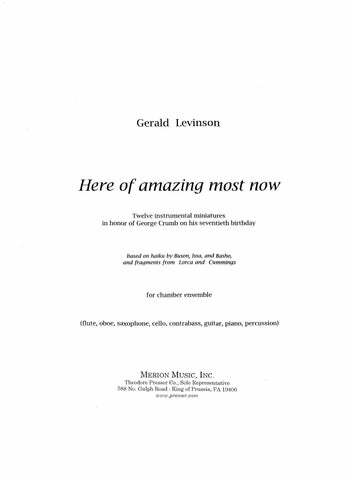 Gerald Levinson’s world is very much his own, a world of superb orchestral brilliance, vivid gesture, strong, pliable rhythm and long-reaching form… One might feel even that he has not invented but discovered the finest of his works as relics of an ancient civilization might be unexpectedly discovered in some jungle. …a most atmospheric listening experience… The score is not only very evocative— it’s also a model of colorful yet always tasteful orchestration. This is obviously some…music which is well worth hearing again. …explores the emotional value of tension and release. After the initial clouds disperse, almost everything else sounds like supreme sweetness … cosmic quality. …this lively piece had an aptly festive air…pointed orchestral textures and earthly percussion effects. …a garland of 12 little tone poems… instrumentally exotic and ingenious… Certainly it had a fresh, strong sensuous charge. …11 elliptical songs to an instrumental backdrop that shows the strength of the single instruments. Colors flow through this music, which accumulates mood through its references to Bali’s music. Here and there one feels whiffs of a Balinese mode of flute or gamelan, but mostly this is personable, intensely pictorial Western music that serves the evocative poetry of Nanine Valen — the composer’s wife — very well indeed. Levinson seemed to revel in the color of those forces, creating big moments and flashing shafts of sound. Levinson is particularly gifted at creating harmonies whose voicings and intervals (and extensive use of winds as coloring) take on the quality of exotic ‘meta-instruments.’ It’s almost as though the whole ensemble were a single, large instrument playing in a wholly natural, yet alternative, tuning. …demonstrates his ability to create whole and convincing musical worlds between Western soul-searching and Oriental (Balinese) joy. Levinson’s distinctive voice makes his music immediately attractive, but with deep resonance that invites continued investigation. …a beautiful piece of chamber music that creates many a mood that lingers long after the music has ceased. …a strongly colored tour of the sonority and mood of some Balinese musical expression. His wide range of enthralling percussion sounds — gongs and chiming metallic shimmers — complete the picture. Shadowy, veiled, and mysterious… the arcing finale has the timelessness of the ‘Ewig’s’ in Das Lied. …brimmed with melodic fervor, beguiling lyricism and instrumental color. …a brooding, moody piece of considerable beauty. Just as the sea itself is music, Levinson’s work is not merely music, but also a state of mind, of sensing with your whole being… The rocking waves, splashing foam, sounds of ships and gulls — the very speech of the sea — are relived. …one part Debussy and one part North Indian, and an exhilarating show of virtuosity. [it] began with a beautifully spare series of notes sounded in octaves, so meditative and widely spaced as to suggest ripples on a pond. …un grand sens des couleurs et des rythmes. It is in the third movement… where a kernel of human drama and tragedy is introduced, that engages the listener beyond a mere contemplative admiration. This is a beautiful, moving movement in which Levinson’s gifts seem at their full power. 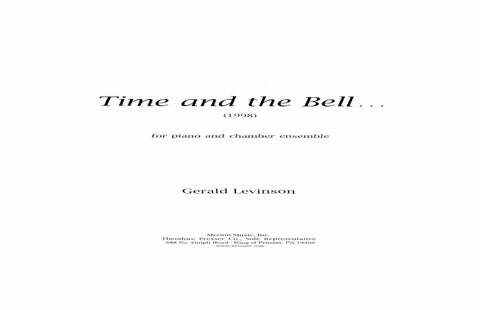 Levinson’s “Time and the Bell” draws on Balinese gamelan sounds and the rhythms of Indian raga, to pungent effect. Levinson’s colorful and approachable new work…covers an impressively broad range of expression and dynamism with polished economy. 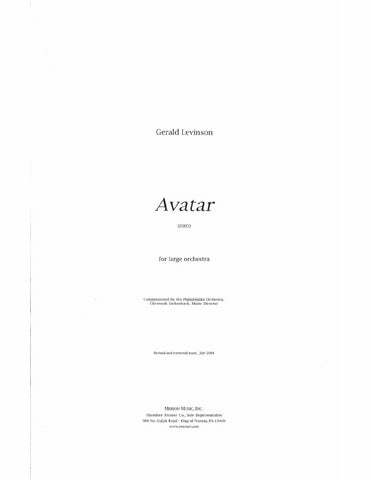 Levinson’s piece, full of bell sounds and brimming with Asian atmospheres, was a swift conflation of musical styles of two worlds… an intriguing Western take on Indian thought. A rare gem… Levinson’s imaginative writing and colorful instrumental timbres conjure up vivid imagery… The result is a meditative, thought-provoking (and mood-evoking) journey whose six movements take the listener through a seemingly endless array of irresistible, modal flavors. …splashes of color…rich in astringent dissonance. 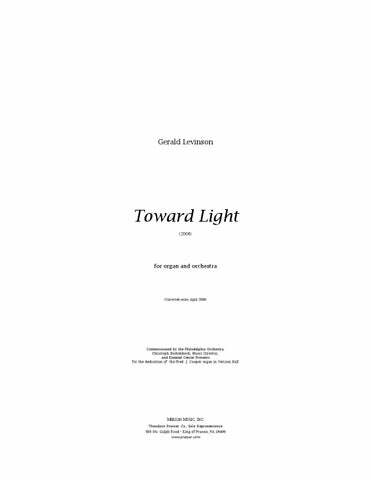 Gerald Levinson’s “Toward Light” was the most satisfying performance of the organ-extravaganza program. Its angular, colour-rich spectrum captivated from the opening measures. …full of arresting, modernistic sonorities…in a firm rhythmic framework. Its 7-minutes opening superimposes fast, skittery figures over slow, plangent bell-sounds, managing to be both active and agitated yet at the same time evoke a distant vista of unchanging timelessness. This remarkable movement, distant kin to the dazzling “Crystal Liturgy” that begins Messiaen’s Quartet for the End of Time, exhibits Levinson’ genuine gifts at their best and remains in memory to haunt the mind’s ear. [Levinson] gave the clarinet a range of sonority from a low, husky call to sweet stratospheric melodies in which he vied with harmonics on the cello. The rhythmic vitality of the music brought boldly colored playing from all three. 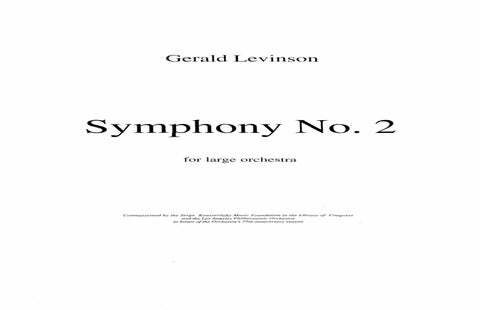 Mr. Levinson’s trio, which includes a dreamy chorale sequence embellished with glassy harmonies, is richly and imaginatively scored and skillfully put together. A captivating piece that combines a Crumb-like command of delicate, beautiful timbres and a sure sense of form. Quite primal in its outer sections, Levinson expertly suggests the Hautes Alpes’ craggy peaks and glaciers. And he hints at the landscape’s soft beauty by way of the crystalline sounds of the harp and bells. The incorporation of the piano into this orchestral work is superb. Its role as a percussion instrument is clearly defined by the composer’s separation of winds and percussion in color as well as groupings. The two-part Levinson premiere was a craggy, 16-minute nature-evoking soundscape that showed real capability in handling large instrumental forces. Performer(s): Elizabeth Fulford, soprano; Eastman Musica Nova, Sydney Hodkinson, conductor.